Home > Stocks > Housing Stocks Rally To A New Roof? A key index of housing stocks hit a 9-year high today – but will its break above the 2015 high be sustainable? The recent historically tight range-bound trade in the major stock averages continues to unfold, but in a rather interesting manner. The lack of direction in the averages is partially the result of a tug-of-war of sorts on the part of the underlying sectors and industries. As an example of this dichotomous action, today saw the Nasdaq 100 close almost literally unchanged (down -0.003%). However, on the one hand, areas like oil stocks were down 2.5% to near 1-month lows, while on the other hand, housing stocks closed solidly higher to fresh 52-week highs. 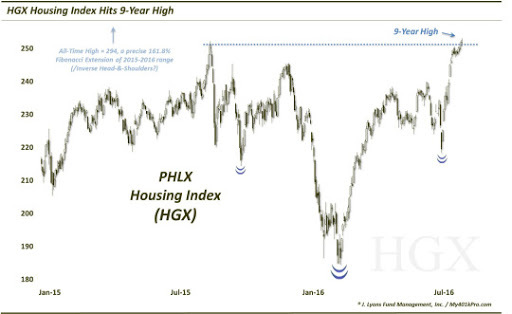 As a matter of fact, the PHLX Housing Index (HGX), subject of our Chart Of The Day, closed today at a 9-year high. The question, obviously, is whether the new highs are part of a new up-leg in the sector, or an insignificant breach in the development of a double top. As the chart shows, while technically a new high, today’s close of 252.45 is only 25 cents above the high of last August 18. Therefore, it’s a bit of a reach yet to declare this a “breakout”. That said, the chart has a few things going for it, if you are a bull on housing stocks. First off: momentum. The HGX has demonstrated explosive momentum off of the post-Brexit lows, enabling it to break the post-2015 Down trendline and make a beeline to the August 2015 highs. And while short-term momentum is certainly extended, there have been no significant price/momentum divergences. Furthermore, it is the type of “overbought” momentum that tends to lead to further gains, eventually. We say “eventually” because a bit more of a breather wouldn’t hurt the index before attempting a durable breakout. We’ve talked before about the healthy process of consolidating at prior highs before attempting to break out. When an index makes a breakout attempt after being up on a rope like the HGX is now, the breakout has a tendency to flame out. However, a little breather would allow the HGX to catch its breath so it has the necessary fuel to sustain a breakout when it occurs. And, as we said, the overbought momentum displayed by the HGX in recent days is a “healthy” type of overbought that usually has more eventual carry-over. 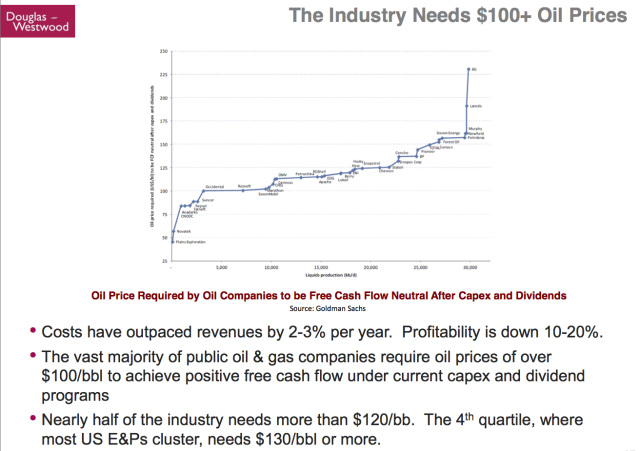 And considering the vicinity of current prices, carry-over will be critical. Obviously, the failure to convincingly break above last August’s top will usher in the “double top” calls – and for good reason. We always caution investors not to anticipate a breakout and the same holds here. It is also important to keep in mind that, should the HGX convincingly break above its 2015 highs, it will not be to all-time high ground. 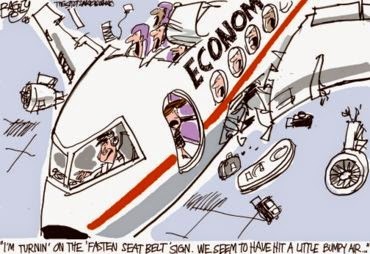 The all-time high was set back in 2005 at 294. Thus, while a successful breakout would open up significant upside, it would not necessarily be unlimited upside. Another interesting bit of bullish potential comes from a possible inverse head-&-shoulders pattern on the HGX chart since last summer. An inverse head-&-shoulders is literally the inverse of a traditional head-&-shoulders pattern. That is, it identifies a formation of various lows with potentially bullish ramifications. In this case, the 2 shoulders would be the September 2015 plunge and the Brexit dip, both bottoming in the 210′s. The head is the February 2016 low near 185. Obviously, these types of things are up to one’s interpretation, but if it is an accurate read of the chart, the pattern would suggest an eventual breakout above the August 2015 (and current) highs. One interesting note is the location of a possible “target” upon a potential breakout. 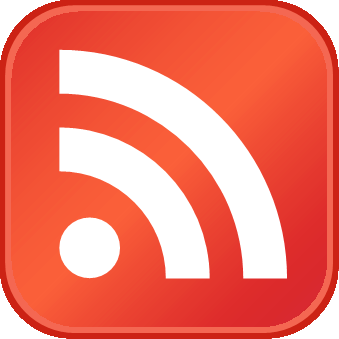 While you may know we are not really fans of setting targets, per se, they can serve as a rough guide as to price behavior in certain circumstances. In the case of head-&-shoulders patterns, the suggested targets upon a breakout vary from the range between the shoulders to the breakout point and the full range between the head to breakout point. We actually favor using Fibonacci extensions in these instances, with the 161.8% being the most reliable. That is, hypothetically upon a breakout, prices would move above the breakout point by an amount equal to 61.8% of the pattern’s full range. In this case, adding 61.8% to the current range yields 294 – exactly the all-time high from 2005. Again, we’re not suggesting prices have to hit that level simply because certain analysis line up that way. We will say that, in the event the HGX rallies to 294, we would almost certainly be looking to lock down some profits. We are getting ahead of ourselves, however. First things first, the HGX needs to convincingly break out above its August 2015 highs. Given some of the factors we mentioned, there is certainly some compelling evidence to suggest this will happen. However, again, we don’t want to anticipate a breakout. Therefore, we will watch the previous highs and use them as a guide for orienting our expectations. Above 252 and housing stocks could build another leg up in their post-February (and post-2011) rally. However, a failure to reclaim that level could put a roof on the housing stock rally for some time.